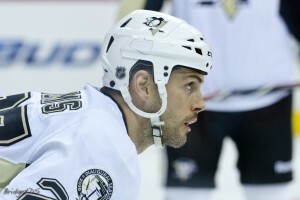 After tidying up the front office, the Penguins have addressed a major free agency uncertainty and resigned forward Craig Adams to a two-year contract extension worth 675,000 dollars per year. The deal will likely take the 34 year-old forward to the end of his playing career, and at a raise of 125,000 per year over his expiring contract. The deal works well for a player who was claimed off of waivers in 2009 and for a team which has almost no cap space to speak of. General Manager Ray Shero tabbed Adams as a priority early in the off-season and was able to lock up the penalty killing specialist after a week or two of (disclosed) contract negotiations. The Penguins have been less than forthcoming with information on talks with their pending free agents, but negotiations with Adams were known to have been taking place since at least last week. After reaching a bit of an impasse earlier this week, terms were met Thursday afternoon. Adams is a fourth-liner who has shown the versatility to play at any forward position, something that was at a premium last season as the Penguins saw each of their top five centers felled by injury for at least 15 games apiece. He’s also very responsible defensively and brings energy on every shift, blue-ribbon traits for a fourth liner. Adams has displayed a toughness and willingness to sacrifice his body that make him the prototypical Dan Byslma player. 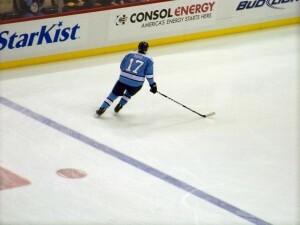 Above all, Adams was resigned for the role he plays on the Penguins’ top-ranked penalty kill. He has been a mainstay on the unit for the last two seasons and is perhaps the team’s best defensive forward, if not Jordan Staal. Adams, who led the team’s forwards with 3:05 shorthanded minutes per game, helped Pittsburgh become the No. 1-ranked penalty killing unit in the NHL in 2010-11 with a success rate of 86.1 percent – the first time in franchise history the Penguins boasted the league’s top PK. In two-plus years with the Penguins, Adams has chipped in 26 points (4 goals, 22 assists) while missing only two games in his two full seasons with the team. In three postseasons with Pittsburgh, the forward has six goals and nine points in 44 games. Clutch? The Harvard graduate has some. Adams is a career .152 PPG player with the Penguins during the regular season, a percentage that jumps to .204 in the postseason. Fans will remember his rising backhand goal scored in game one of the 2010 Eastern Conference Quarterfinals against the Ottawa Senators–it was his first in 83 games in 2009-10. Adams joins Nick Johnson as the only Pittsburgh free agent to have been resigned as the beginning of free agency inches closer. According to CapGeek.com, Pittsburgh has just north of 55 million dollars committed to eight forwards, seven defensemen and goaltenders Marc-Andre Fleury and Brent Johnson. With the cap still officially set at 59.4 million (that number is expected to rise to between to 60 and 63 million), Pittsburgh still has eight forwards left to sign. Max Talbot, Mike Rupp, Chris Conner, Tyler Kennedy, Eric Godard, Dustin Jeffrey, Pascal Dupuis and Arron Asham are all due for extensions, though nothing official has come from the team. Penguins brass have already stated that the team will not seek to retain Alex Kovalev or Mike Comrie. The hardest players to resign have to be Tyler Kennedy and Max Talbot. Kennedy is a restricted free agent and is coming off a 21-goal season. Some have him being moved in a sign-and-trade deal but whispers are just that–whispers. Talbot has seen his production dip and is already making over a million per season, the kind of number Ray Shero is unlikely to offer again despite Talbot’s status as a fan and locker room favorite. Promising young center Dustin Jeffrey ought to be a priority and should be affordable coming off of major knee surgery, and winger Pascal Dupuis has been a serviceable first-liner for the last two seasons. At best, Pittsburgh can only expect to retain one or two more of its veteran forwards. The affiliate clubs are loaded with talent and the Penguins have precious little cap space to work with. Ray Shero has shown an unwillingness to sign role players to long or expensive contracts in the past. Expect that trend to continue as the calendar crawls closer to July.